I realized the other day that I never really did a wrap-up post to our big 50 day summer road trip. I'll be honest, when we started I was not so sure that I wouldn't be running home in a week or two with my tail between my legs. We made it through the whole thing though, and not only that, but everyone had such a great time that we have decided to do another 50 day trip next summer. I learned a lot about myself during that trip, and I learned a lot about each of my boys. There are some things that I came to realize that might help others who are planning a crazy adventure like ours, so I wanted to share. I am all for being spontaneous, going with the flow and seeing where the wind takes you. 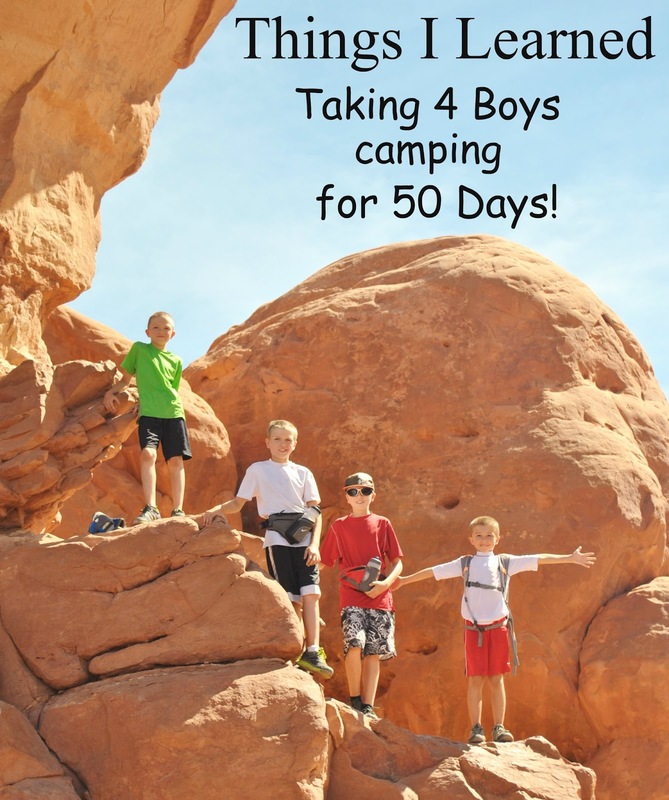 However, when you are traveling alone with 4 boys, and it is your job to make sure that you have a place to stay, have fun and keep safe, a plan is a must! You don't need to go as far as planning every second of each day, but knowing where you're headed, addresses, phone numbers and other important information ahead of time is crucial. 2. Have a Second Plan! It sounds redundant, I know. I did not have a second plan however, and when we showed up to Blanchard Springs and they said there was no room at the campground, I was almost in tears. Where were we going to go? It wasn't exactly a busy city. We ended up 7 miles down a very dirty and dusty gravel road with no water hook-ups and vault toilets, and everything worked out fine, but it would have been better and a whole lot less stressful if I had had a back-up plan. This contradicts the last two pieces of advice, but this applies more to your day to day activities, and less to where you will actually go and stay. While you need a plan, it can't be so rigid that the slightest variation from your "plan" makes you freak out. For instance, the kids are not always going to want to do what you planned and thought would be fun. Trust me, I made plans to visit different museums, take beautiful long hikes, and sometimes they just weren't having it. Trying to stick to my original plan led to anger and frustration. Then, when we gravitated from the plan and just hit a local public pool, we had a blast. You have to let go of your idea of the "perfect family trip" because it doesn't exist. This is not the same as having a plan. This is more about knowing what to do in certain situations, learning about the areas you are going to and even its wildlife beforehand. The more prepared you are, the smoother things will go. The first time I saw a tarantula staring at me face to face on the wall when I walked out of a bathroom in Oklahoma, I about died. The first time I walked into a campground toilet that had no doors on the stall I did the same. When I found myself in a torrential downpour with a dry spot as big as the grill trying to make homemade pizza on said grill in the rain, I almost gave up and went home. I was prepared though, so I knew the tarantula wouldn't hurt me, I learned to pee really fast, and I managed to make pizza that the boys graciously said was the best they had had in their lives, even if it had a few rain drops on it. The memories and perfect vacations you see in commercials and those ad campaigns that bring a tear to your eye, they don't exist. Why? Because we are humans and not actors that are paid to paste a smile on their face and have the perfect fake vacation. Don't get me wrong, you do make amazing life-long memories on trips like this, but you also have to deal with life. I'll tell you a secret. You know how your kids fight and misbehave at home? Yeah, they will actually do that on a 50 day camping road trip too. I never got my perfect quiet moment when we would all gaze out over the Grand Canyon and just stare in quiet awe. Nope, in fact, I never even got a quiet glimpse of it. I did however, hike the trails around the rim, watch the super moon rising over its edges, and almost got knocked off the side of it by a psycho bat one evening. While it may not have been the perfection I had pictured in my head, it was pretty darn amazing. This is perhaps the biggest piece of advice that I can give you about taking a massive and amazing trip like this with your kids. You need to soak up every moment that you can. Because, while it seems so long and never-ending at times, it really will be over before you know it. Document it all with tons of amazing photos, and even make sure you are in one or two. Since I took the boys solo, I only ended up in one photo with them the entire trip. Kind of sad. I do however have enough photos that hold enough memories that will last us a lifetime! I won't lie and make it all rainbows and unicorns. Taking 4 boys on a 50 day road trip was not easy. In fact, it was one of the hardest and most challenging things I have ever done, but it was also one of the most rewarding. Hopefully, the tips above will help you on your family adventures as much as they have helped me. These are absolutely wonderful to remember during any vacation with any number of children involved. You're a super star with more patience that I think I would ever have! I really admire you Kathleen! I would love to be able to do this with my kids someday. #5 is perfect! I think so many people expect perfection and get so let down when the littlest of things go wrong, like rain, instead go out and enjoy it. Don't let it get you down and enjoy what's around you. I don't think I could have survived with my three! I admire your strength and determination.